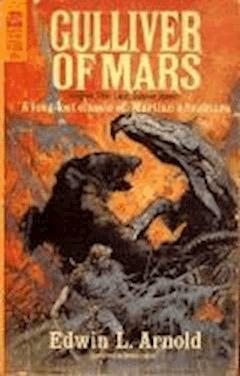 Many believe that Edgar Rice Burroughs' inspiration to create his world of Barsoom came from this novel. Transported to Mars in a most unexpected fashion, Lieutenant Gulliver Jones, U.S.N., promptly found himself head-over-heels in adventure and romance. Mars was a planet of ruined cities, ancient peoples, copper-skinned swordsmen, and weird and awesome monsters. There was a princess to be rescued, a River of Death to be navigated, and a strange prophecy to be fulfilled.